When it comes to collecting Vintage Star Wars there never seems to be a dull moment, and needless to say the last few years have been unique unto themselves. New movies via the sale of Lucasfilm to Disney have lead to a renewed interest in the franchise and ultimately an up-swing when it comes to all things from a galaxy far, far away. With the renewed interest in the franchise we’ve seen the same revival in collecting, and in a few cases collectors too. One collector in particular has been the subject of many news segments and interviews. He currently holds the world record for the one thing that has him high on so many radars: a 6 foot 5 inch guy in a black costume. For those of you that are lost at this point, let me introduce the collector: the Dark Lord of the Sith of the Star Wars collecting world Bill McBride. Bill is a long time collector and contributor to the hobby. 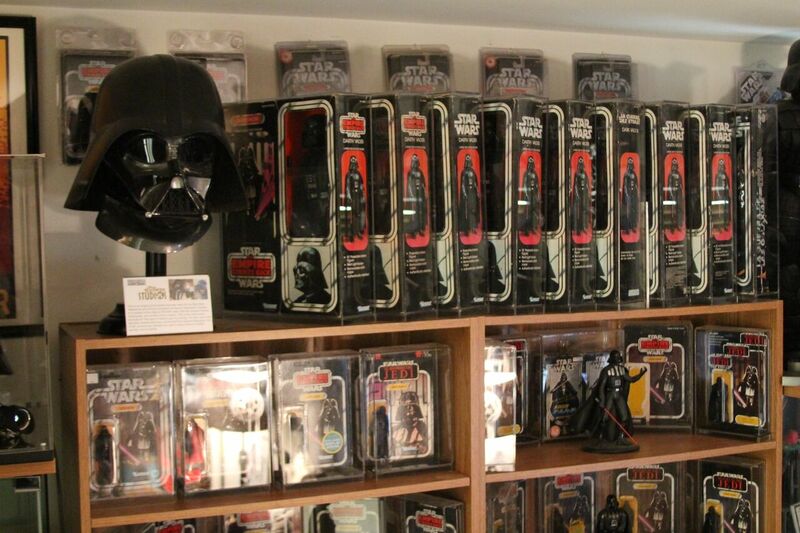 From being one of the first “focus collectors” to his contributions to web forums and the Star Wars Collectors Archive, it’s hard to imagine this hobby without Bill. In addition to his many contributions and general love for the Hobby, Bill is a stand-up guy in so many other ways. He’s a former Marine, and graduate of Virginia Military Institute, needless to say his service didn’t stop there. In addition to helping other collectors, and serving his country, he’s very involved in making his community a better place, donating time to Animal Shelters and general philanthropic efforts throughout the community. Needless to say I was excited to have the chance to chat with Bill and learn more about all things Darth Vader in hobby. FP: Bill, thanks for taking the time to talk to me about your epic collection and story. I think there’s only one place for us to start and that’s the character itself. 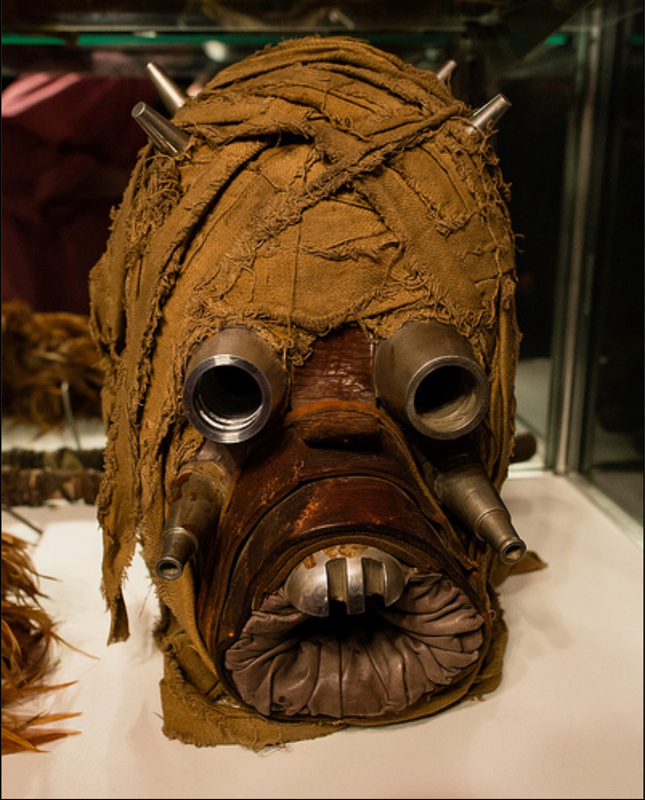 He’s the subject of many stories in the Star Wars universe, but so little is known about him. His image is instantly recognizable all over the world, so what is it that makes Boba Fett the best Star Wars villain? FP: In all seriousness though, why Vader? McBride: It’s the nuts and bolts of the character, the world class talent that went into building the character. Ralph McQuarrie, he needs to be big and imposing, we need an imposing character like a bodybuilder that can act and there comes David Prowse, we can’t have that accent we need a deeper voice, in walks James Earl Jones...superlative off the chart character. It shows how amazing the character actually is. Some people say it’s weird how you like the villain, but in the real aspect of the character he was the antagonist but he’s really transcended the atypical villain. He’s instantly recognizable, and although he’s imposing, kids love him. FP: What was your earliest memory of Star Wars? McBride: Going to the store was the first collecting memory. We lived in the country and I remember going into town and seeing him on the peg hook. I instantly gravitated towards that figure. FP: So how did you get into collecting? McBride: My father was a bit of a collector. I loved Star Wars and I loved the character and wanted to learn more about him, who he was, what was his backstory, etc. FP: So did you remain a collector through your life or was there a down period between your childhood and adulthood? McBride: As a young adult, I thought it was a great opportunity to collect and get back into it. Out of high school I went to an academy (VMI) and then onto the Marine Corps. Having a hobby is something that always interested me. I don’t really recall any watershed moment where I was full throttle ahead, I was just doing what I liked. I just had more free-time, I went to more shows and that’s when I spent more time on the hobby. At the time there wasn’t such a thing as a “focus collector” like there is today. It was a simple ideology: Vader was the only thing that interested me. If I had two 12 backs in my hand and one was Luke and one was Vader, I would take Vader no matter what. Doing my homework and my research, one thing that helped me was focusing on stuff that I didn’t see; the rare stuff that I never got to touch in person, so I sought these things out. 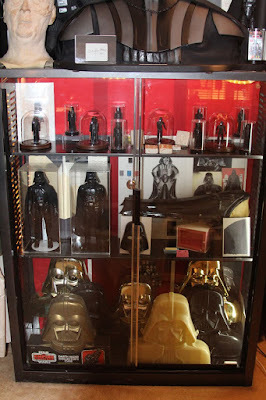 Vader is so universal that there are literally tens of thousands of items bearing his resemblance. Here we’ll dig into some of Bill’s specific tastes and personal favorites across his massive collection. FP: So what are your favorite action figure related pieces? McBride: Prototype -- Prototypes always win out over production pieces. 4” has been a big area of focus and always has been, even from the early days. Even in the early days when I knew it was out there and I was trying to find it every chance I’d get. 4” Vader stuff has always been really tough to find, there’s not much out there. There’s only a few samples, EPs, and hardcopies. My test shot is the only one that I’ve ever seen. There’s maybe 6 internal prototypes, which isn’t many at all. My test shot came directly from Kenner employees and sources, a few pieces came from The Earth in Cincinnati. One of the coolest things I’ve ever seen was at The Earth. Darren [Murrer] let me look at some stuff in the back room and he pulled out the Star Wars vinyl case and it was full of hardcopies. Anyone that has pre-production more than likely can trace some of their prototypes back to The Earth. FP: What are your personal favorites in the pre-production area? McBride: Personally favorites: 15” hardcopy, first shot, ESB box flat, Toy Fair 15” sample for the ESB release (regular figure but it’s boxed up in an ESB box). The challenge with flats and trying to find them is that early on they were used to re-box the items. A lot of them went up in price because of that. The thing that is really cool about these is their aesthetic charm. FP: Your toy collection is expansive to say the least, but I know your Vader run goes a lot further than that. What's the next biggest segment that you focus on today? McBride: Props are very high on the list. I’ve been doing a bit of both screen used props and the Master Replicas/EFX stuff as well, even into Illusive Concepts. When it comes to original props, they’re really challenging. Once you get into props you start to realize that it’s so much more complex, it’s everything (Paul Allen is a prop collector). You have to be more strategic, you have to have good resources and contacts. There is so much more research that goes with it. People like to screen match, and that takes time and effort. There’s not a lot of hand holding when it comes to props. There’s no one that does authentication. There are great resources and good people. You can ask them questions and there is a good market of dealers (PropStore for example). It’s fun. I think that it’s an adult realization of a childhood tie-in, as kids we wanted the toys to live the movies and as an adult it takes it to another level and we own pieces of Star Wars. It’s so tough. Pieces are few and far between, but I have found a few original props. 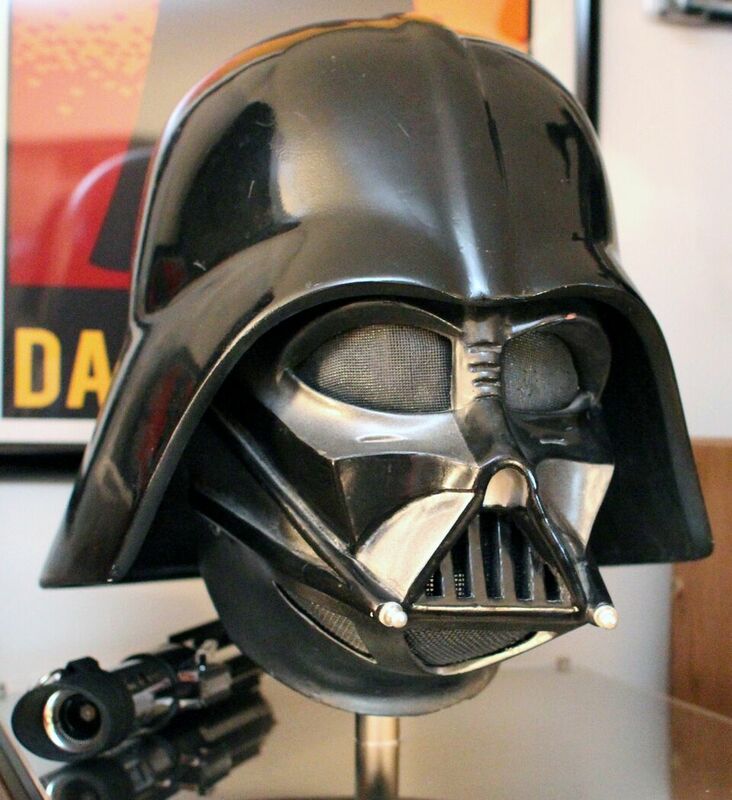 There’s nothing more iconic than Vader’s helmet. There’s a few pieces from the Original Trilogy, some from Revenge of the Sith, and even TV related, and theVader helmet from the George Lucas Super Live show. FP: One piece that’s gotten to be really popular the last few years has been the Double Telescoping Lightsaber Darth Vader. Even loose examples go for $10K+. What are your thoughts on the DT Vader? McBride: There’s a lot to the Double Telescoping Vader, as there were several versions. The main differences are just prototype to production...early samples that lead up to the final production piece. 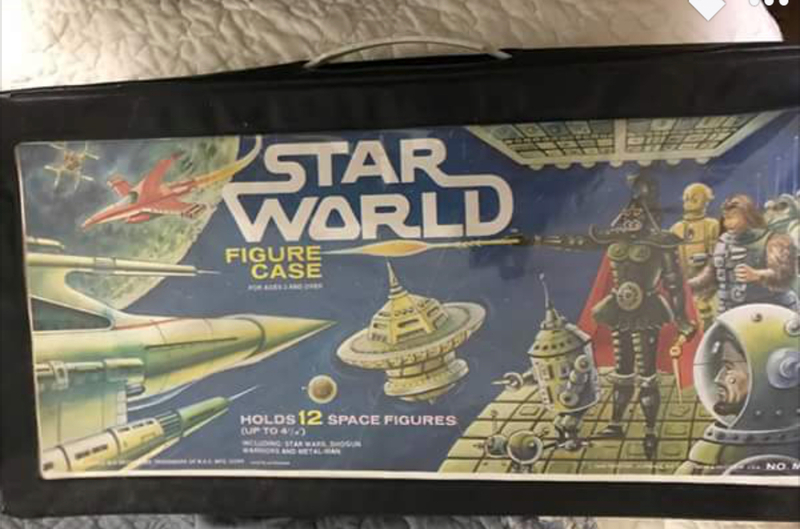 The first example is in Plastic Galaxy, it’s the one that you typically see up for sale. The earliest one was the mushroom tip which has a small piece at the end of the saber. They took two of the mushroom tips from the mold, instead of finishing them off and putting the discs together, they glued the two ends together and it ended up being like 4 inches long. The disc maybe was developed to give you better grip on the saber. The final design was the circle double telescoping saber. FP: Given he’s been part of every film and toy release in the Original Trilogy, how many variations of carded Vaders are out there? McBride: There’s over 100 variations that you could collect: foreign, (Toltoys, Clipper), back and front etc. It’s funny, people see the collection and they always ask what’s the difference. The figure never changed. It was always about the packaging. FP: What’s your favorite cardback in the domestic release? McBride: Power of the Force Vader. The coin the aesthetics, it comes together and is a very cool looking carded figure. Foreign: Empire Meccano. The logo changed and it's a rectangular carded figure. FP: So when it comes to other pre-production pieces, what are some that stand out to you? McBride: From a 2D perspective: Revenge of the Jedi mock-up card. It’s an unused Empire card, same as what they did for Luke X-Wing. Those came from a guy that worked for Kenner. At the end of the day my favorite is the POTF Cromalin -- just the best packaging design, the colors are so bright with the Cromalin... they’re stunning. 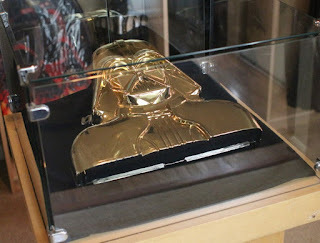 When it comes to 3D pieces my favorite piece is the Empire 15” boxed sample. Other pieces like the carrying cases are great too. I have a few stages of the case: dull gold, black with no COO and a white one. These are the rarer pieces. When it comes to the shiny gold chrome cases, there are about 100 out there. They were painted on top of black or dull gold cases and there are several variations in the group. FP: What keeps you going after all these years? McBride: I have fun with it, I’m really passionate about it, it makes me happy. The cool thing I’ve done with Vader is that I can take a break on one segment and then work on another segment. You can do anything: hats, shirts, buttons etc., and that’s the key to longevity in the hobby. It’s easy to stay true to your focus as there’s so much with Vader. FP: What are some of your interests outside of collecting? McBride: I’m very active with my local shelters and spend a lot of time with German shepherd rescues specifically, as I have three shepherds. Working out lifting, I used to shoot competitively, long range high power specifically. Outside of that I stay active in the community from a philanthropic point of view. FP: Does your Star Wars collection spill over into any other collectibles? McBride: I’ve picked up a few other hobbies over the years. Watches and firearms are the main two. I’ll be taking over a Civil War artifact collection as well. FP: I saw your presentation at C7. It was a fun event, but what stands out to me is the last picture you, Skye and that C-3PO guy Bill Cable posted of the three characters in Sunnyvale. If you lived in Sunnyvale who would you be? McBride: Julian -- he’s the built guy with a drink in his hand. Granted, I do have the occasional Ricky moment. FP: Were you a fan of the man they call Vader (Leon White) of WCW/WWF fame? McBride: Not really -- I was a huge fan of the WWE at one time. FP: How have the last few years collecting been collecting wise? Have things changed for you since the resurgence of the brand? McBride: Not really... still focused, didn’t expand. FP: Closing up, you’ve done a lot of interviews because of the expansiveness and focus of your collection. What’s the most common question you get about your collection? McBride: Most common, how much is your collection worth? Or what’s the most valuable item? FP: Typical... we’ve all heard that question before, just maybe not from a reporter. I want to thank Bill for his time and being open to us learning more about him and his collection. What color is Luke Skywalker's hair? If you answered "blonde," well, congratulations! You've evidently seen Star Wars. Did you also notice that Darth Vader wears black? But as guest blogger Ben Sheehan points out below, recognizing a hair tonality known as "blonde" is one thing, and translating into toy terms is quite another. Here's Ben with the details. Ever wondered why Luke Skywalker seemed to suffer a follicle related identity crisis at Kenner? You’re not alone. One question has vexed Star Wars collectors for decades: namely, why did Luke Skywalker’s hair color mysteriously shift from yellow to brown (and every shade in-between), during the vintage Star Wars era? On 12 backs in 1978, Luke’s noggin was yellow. On ESB 41 cardbacks, it was dark brown. Soon it was orange ­– then light brown; then dark brown, and yellow again. Lukes with different colored hair appeared on the same ROTJ blister card back at retail in 1983 – confusing children, and then baffling adult collectors some 40 years later. Luke Skywalker Original, Bespin, Jedi and Stormtrooper have all suffered from the same, near rainbow-haired phenomenon. Even prototypes of Luke seem to have been dressed at entirely different salons, with multiple hair colors existing for the 4 versions (X-Wing, Poncho and Hoth all wore head gear) during the pre-production stage. 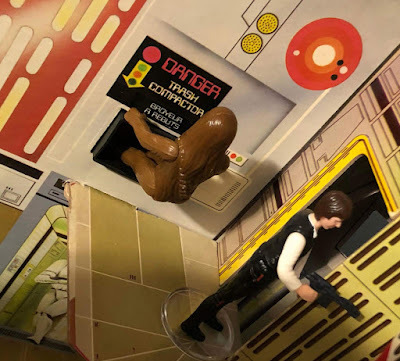 Ask most Kenner employees why Luke’s hair color kept changing (and about most any other figure variation), and they’ll say that they have no idea, or hadn’t even noticed. Some will even ask, "why would you care?" "People ask me that question all the time," says Jim Swearingen, the designer who had the most influence on the first series of Star Wars figures at Kenner in 1977, "but I don’t know the answer." 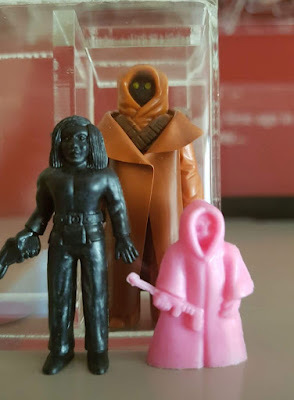 Swearingen’s response led me to wonder more and more, how an even-keeled appearance for the key figure in Kenner’s Star Wars line could seemingly be so unimportant that it wasn’t ever noticed? An answer that made sense slowly revealed itself during research for a fairly comprehensive book I’m writing on vintage Star Wars toys (the project is long overdue – my battle with four years of Kenner interviews and accumulated research materials, along with the quest for pictures, is proving akin to lopping heads off a hydra). I’m lucky enough to have been embedded in the bones of Kenner’s Star Wars team for 3 or 4 years now, and have 14 years of interactions with former employees to draw on prior to the experience. This includes living in Kenner people’s houses, discussing action figures with them over work projects, doing everything from mowing their lawns to fixing their roofs while talking silicone molds, drafting and sales strategies. I’ve been socializing, planning events, sharing drunken anecdotes and generally enquiring about all aspects of the Star Wars line in more settings than this post allows. As a consequence, I’ve likely asked upwards of 50 people about Luke’s hair color. 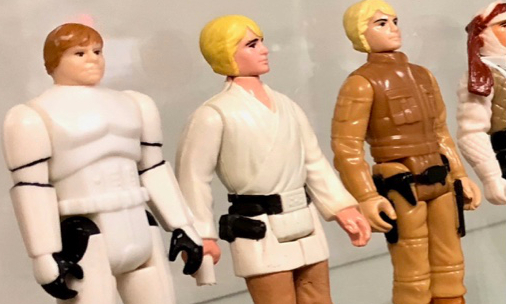 As it turns out, different designers at Kenner actually had different ideas of what Luke’s hair color should look like – which led to the different shades of brown, orange and yellow on Luke’s noggin as each new Luke character was created. But there is even more to it than this simple explanation – the culprit is also paint itself. 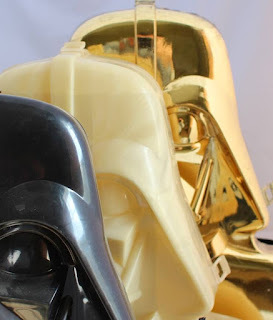 Blonde hair is an accumulation of different colors – not a single color that Kenner could achieve using the cell-vinyl paint they applied to the paintmasters, that were sent to the orient as instruction during the 1970s and ‘80s (particularly on a toy lines such as Star Wars, where the number of paint applications was limited to keep the retail price point down). Painting was such an expense during Kenner’s Star Wars production, that stickers were used on vehicles as a cost cutting measure almost exclusively, right up until later vehicles such as the A and Y-Wing fighters, which incorporated a mixture of paint and stickers to provide detail and decoration. There were not enough resources to apply multiple colors to Luke’s head, in order to achieve a close to perfect blonde. The vagaries of manufacturing at factories in the Orient circa 1977-84 further compounded the issue. 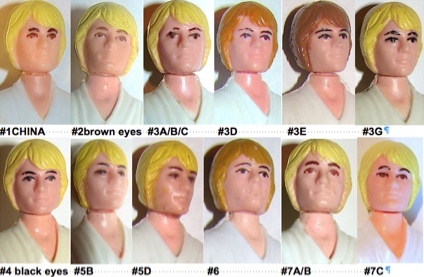 Kenner would send different versions of Luke’s hair over as designers dictated new shades for different iterations of Luke – and then these versions would sometimes each be altered, and further lost in translation during production. Sometimes Orient vendors such as Smile and Kadar were less spot on than they should have been, which produced obvious variation in Luke’s hair. No-one really knew where any of them were getting their pigments or paints, so this was ignored, presumably in an effort to ensure that Luke made it to retailers on time. So what does this ultimately mean to collectors? Very little, but then again, also maybe a lot. While it would be neater to attribute Luke’s chameleon follicles (and so many other details from the Star Wars line) to some deeply technical master plan inside Kenner, chalk it down instead to the small toy company from Ohio growing exponentially, while constantly redefining its manufacturing processes to accommodate and then grow its new 3 ¾" action figure scale (under significant deadline related, time pressure no less). Skye and Steve analyze and review Solo: A Star Wars Story by breaking down which vintage Star Wars collectibles will benefit from the movie and which ones will suffer from it. 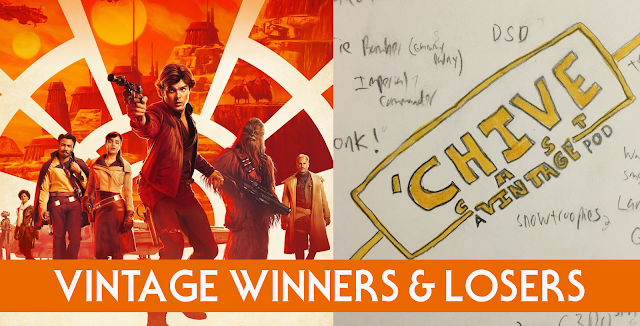 From Snoopies to Troopies, Chewie to Han and from 3PO to Gonk, we cover it all in our now traditional Top 10 Winners and Losers list. How can a new movie impact the collectibility and desirability of 40 year-old toys? Listen to find out our take on the 90th 'Chive cast Vintage Pod: A Podcast Story, Anthology. 47:52 – What about the Bandolier? 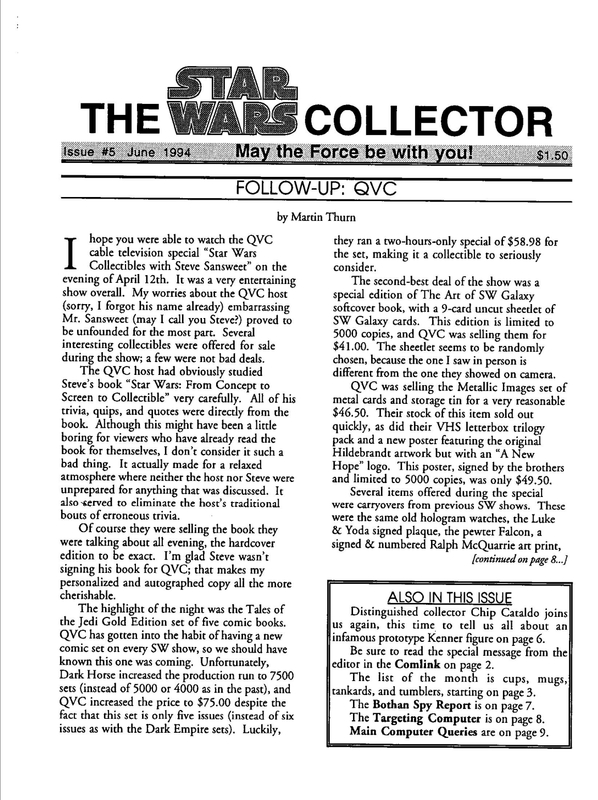 Welcome to the latest issue of Star Wars Community Digest, your place to get summaries about what's going on in the Star Wars collecting community across all of the forums and Facebook groups. We will present the news and current events each week, so that you don't miss anything. Please be aware that many of these are closed Facebook groups though, which means you will need to join them in order to read the conversations. But don't worry, it's free and almost instantaneous. If you are an administrator or moderator and would like your community to be a part of this feature, please let us know. We are always happy to include additional groups/forums in our summaries, but be aware that not every group can be featured every week. 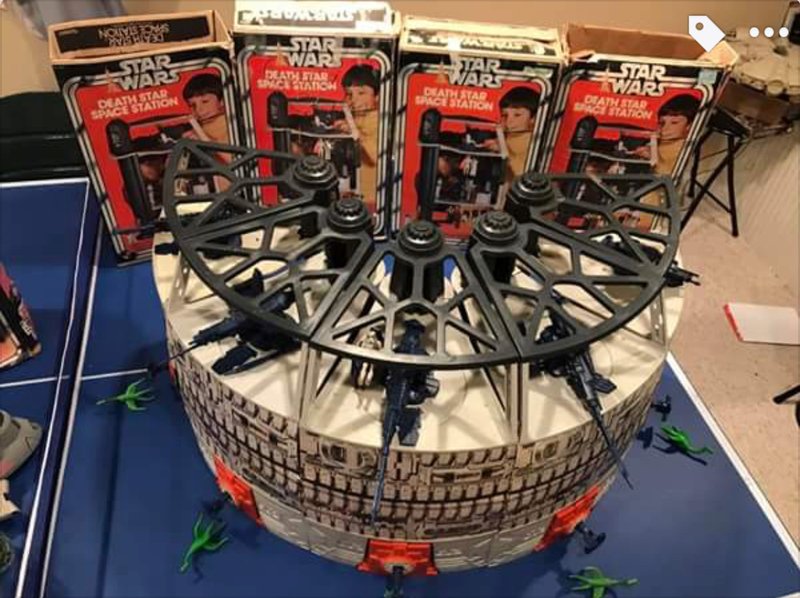 Senior editor and creator of the Star Wars Collectors Archive Gus Lopez has announced that he will be adding new entries to the Archive as well as updating older entries based on his "Daily Grail" series on social media. 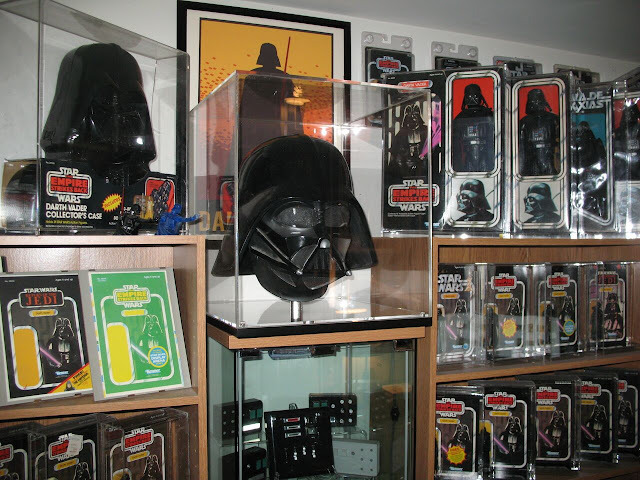 Several new entries will be added weekly and will include original movie props, vintage toy prototypes and other one-of-a-kind pieces from all aspects of the Star Wars galaxy. Any collector will not be disappointed by each of these iconic pieces, so be certain not to miss them in the SWCA's "What's New" section! Ross Barr shares pictures of a very rare Spanish Return of the Jedi Colgate toothpaste premium. For a very limited time, Colgate toothpaste and PBP ( the Spanish sub-licensee of Kenner toys in Spain) offered a free Star Wars action figure packaged with each tube of toothpaste. 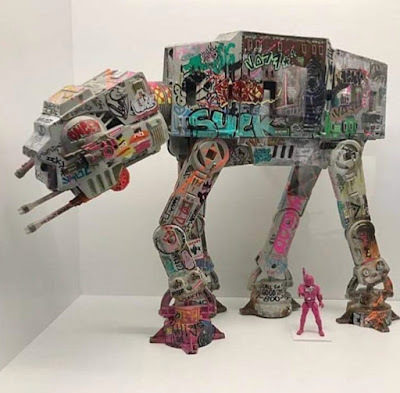 This example with an AT-AT Driver was found by a collector in Madrid is only the second example known to have survived. 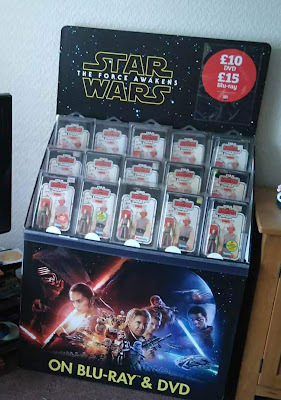 Derek Torc McLean cleverly uses a modern Star Wars DVD store display to feature his vintage carded Lobot focus. This approach is both visually appealing for the vintage pieces as well as for the otherwise clumsy appearing empty store display. 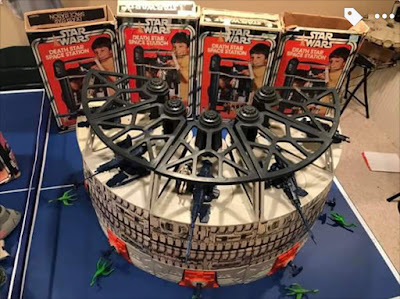 Palitoy and many International Kenner sub-licensees produced a well appreciated and inexpensive pressboard Death Star Play Centre designed for the 3.75 inch figures. These sets were printed in different countries and have quirky variations. Mike Freeman notes one of these variations on the trash compactor signage of his Canadian Death Star which is discussed on this thread in La Guerre des Etoile (Star Wars) Collectors Group. Collector Barry Chalmers uncovers the prototype for an unproduced "Luke Skywalker wrist Communicator" toy concept. The prototype is then pieced back together based on previously found concept art for the piece. Collector Chuck Dillon shares pictures of a toy AT-AT redesigned by New York City based pop-artist Morgan Phillips (also known as the Sucklord ) with a vintage New York City Subway car motif. The graffiti facade design seems surprisingly well suited for the Imperial war vehicle. 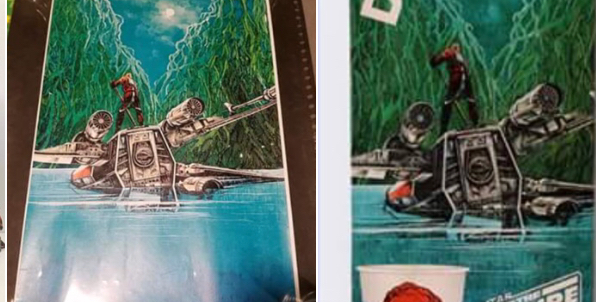 Collector Eric Daniel Vandever shares a printers proof of the artwork for the Dagobah scene printed on many boxes of Dixie cups in this thread in the Star Wars Displays and Advertising Group. Is that Yupi Supposed to be Leia? The elusive line of Star Wars figures manufactured by the Yupi company in Colombia were produced from original miniature character sculpts which were based on the Kenner line of 3.75 inch action figures. The Princess Leia figure is one of a few notable exceptions which does not have any resemblance to the Kenner figure, or to the character for that matter. This point is discussed by the Echo Base Vintage Variants Group in this thread. 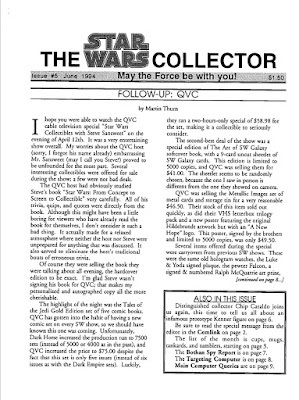 Collector Martin Thurn shares issue #5 of The Star Wars Collector. Originally released in June of 1994, this issue includes an interview with the ever-present Steve Sansweet, including a discussion of his appearances on QVC. The big brass belt buckle craze of the 1970s left the Star Wars fan many choices of shiny imagery to adorn their Levi’s. 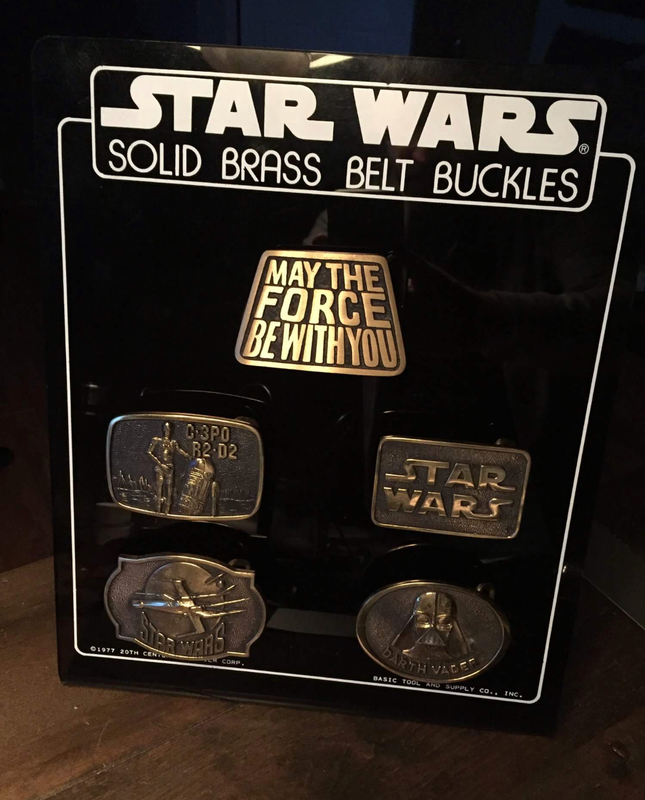 Basic Tool & Supply was one of the very early licensed manufacturers of Star Wars belt buckles. They had 6 original designs forged from solid brass.The designs were very popular and were also produced in cheaper brass plated and painted versions by other belt buckle manufacturers, including The Leather Shop and Lee. Collector and author Pete Vilmur shares his Basic Tool & Supply store display for the solid brass buckles accompanied by 5 of the buckles. We Shall Double Our Efforts! In 1979 Kenner produced a multiple level wedge shaped Death Star Space Station to be used with their 3.75 inch line of action figures. The set includes multiple play environments designed to recreate action scenes from the film. Collector Andrew Solomon assembled 5 consecutive Death Star Space Stations resulting in an impressive semicircular display. As it turns out, 10 space stations would create a full circle. The Emperor would be pleased. Collector Ryan Lehmkuhl assembled a complete set of non-anodized aluminum prototype coins for the Droids and Ewoks lines including examples for all of the unproduced figures from the never released second waves. 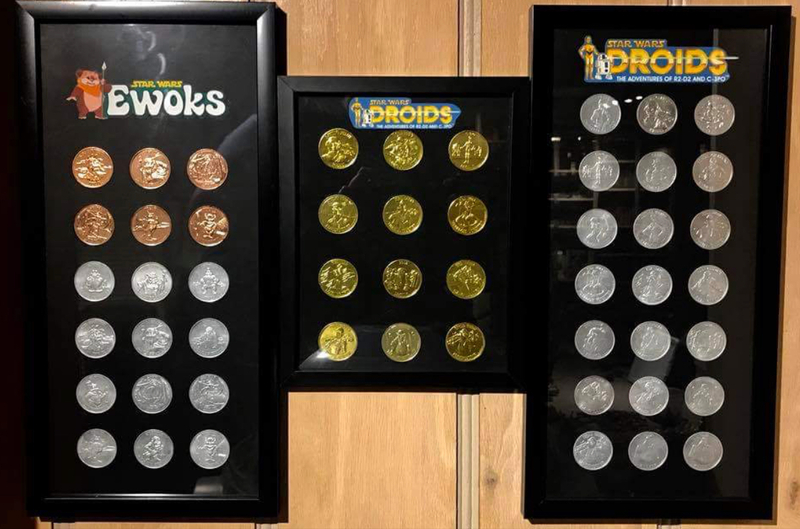 Ryan shares pictures of this impressive accomplishment in this thread in Power of the Force Coins Group. 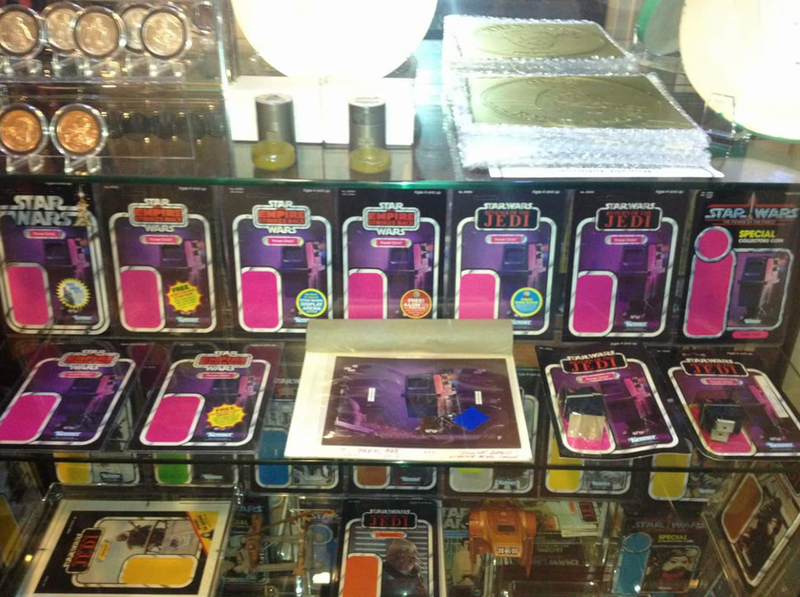 Collector Rob David shares a picture of a very rare Japanese vending machine display for Keshigomu and Gaphacon toys. Included on the display are some rare variations of Keshi. 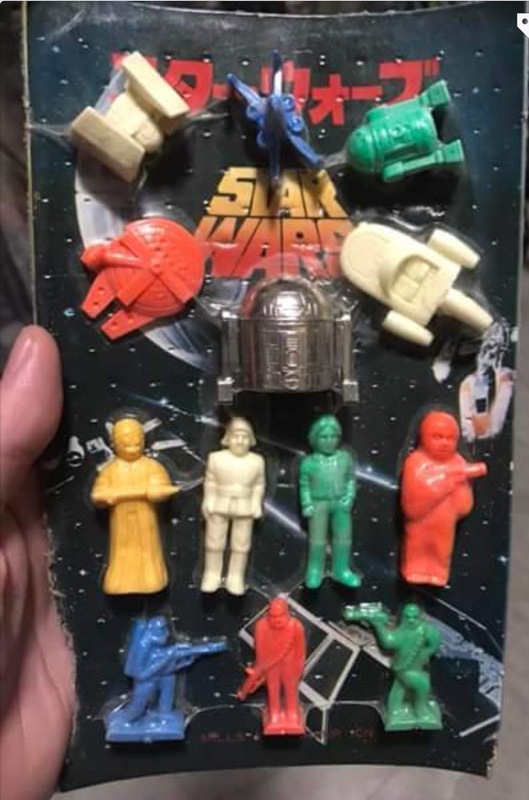 The unprecedented success of the Kenner Star Wars action figure line gave rise to many companies trying to capitalize on the phenomenon. One item that was easy for secondary companies to manufacture at low cost were storage cases for the action figures. 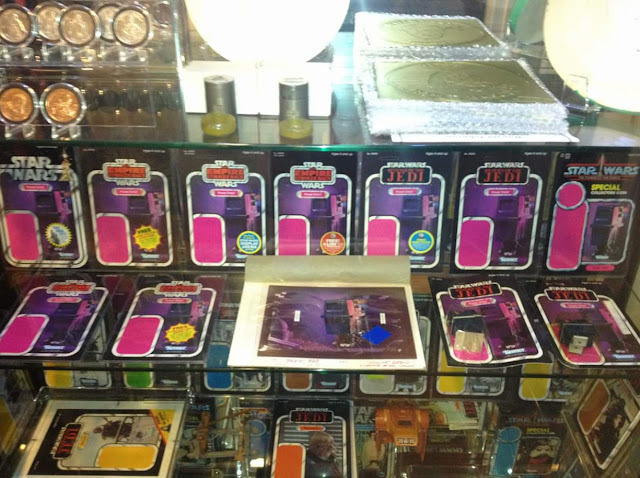 Several companies manufactured action figure cases similar to the licensed Kenner action figure cases with cheaper quality materials at a lower price point. Despite their inferior quality, the bootleg cases feature unique and interesting cover art which give them a kitschy quality. Collector Alan Williams rediscovers one of these knockoff cases and discusses it on the Imperial Commissary. As prototype toy material was uncovered in Cincinnati -- the Hometown of Kenner Toys in the late 90’s -- unproduced conceptual prototype toys were discovered along with production prototype pieces. 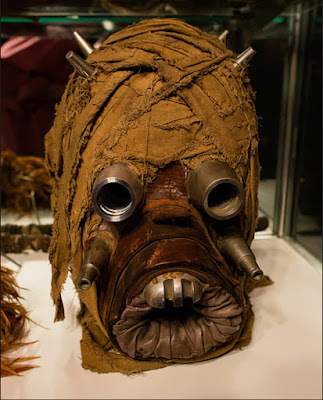 These conceptual pieces often had no known provenance and their individual roles in the Star Wars toy production story remained a mystery open to conjecture. Arguably the most infamous unknown conceptual piece found was dubbed the “Luke in Robes” figure. The Luke figure was found only in hardcopy form, made from hand poured resin and primed in a grey color. Its ultimate final appearance and color scheme remained a mystery. Opinions varied as to the figures role in the toy line. 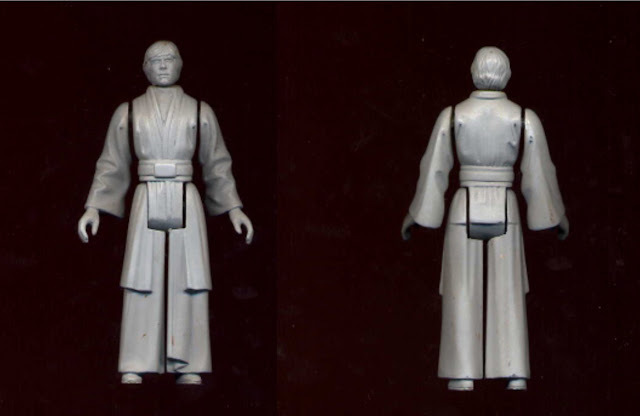 Many collectors thought that the figure may have been a proposed new Power of the Force figure which was never released.